There are 10 such mandaps in Delhi at the moment. The traditional Indian shaadi is incomplete without a 'mandap' - the venue for the pheras ritual that takes place around a holy fire - and becomes a focal point for those much-photographed moments. Taking a cue from the relevance a mandap holds in an Indian wedding, Jeevansathi.com - an online matrimonial platform and part of Infoedge - has adopted some of the bus shelters across our capital, Delhi, for a unique branding and advertising exercise. These bus shelters have been transformed and decorated to depict them as traditional 'mandaps' found at Indian weddings. 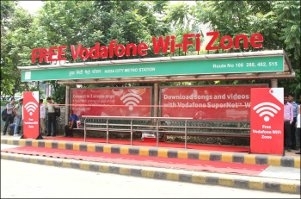 As per the current plan, the bus shelters turned mandaps are already live at 10 locations across the national capital and can easily be spotted by the denizens in the neighbourhoods of Lajpat Nagar (near Gupta Market), South Extension Market, Rohini City Centre (near Ambedkar Hospital), Subhash Nagar (near Pacific Mall), Rajouri Garden, Nirman Vihar, Rajendra Nagar, Jhandewalan, and Tilak Nagar. These establishments have been beautified with flowers and vinyl to grab the attention of the passers-by. Conceptualised by Rapport Media and executed by Red FM in collaboration with Lintas Initiative & Rapport, the total duration of the campaign is one month. The marquee mandap at Saket was created temporarily for a day-long activation in collaboration with Red FM. As part of the activity, popular Red FM radio jockey, Kisna, engaged with shoppers and residents of Saket near the Select City Walk mall on the idea of modern-day marriage. Participants from the crowd had some hilarious takes on the subject. The other shelters will retain the look and feel of the mandap for the entire duration of the campaign complete with flowers and vinyl. The out-of-home (OOH) activity is a part of Jeevansathi.com's offline brand and marketing campaign. In 2016, the matrimonial website launched a successful TVC and digital campaign titled 'Be Found'. The big question was quite obviously, what the thought behind organising this latest 'mandap' OOH activity was as opposed to following the conventional methods of advertising. "As activations are a good way to engage with audiences and create experiences, we felt that this was an effective route for hyperlocal marketing. Along with the bus shelters, we are also advertising in the Delhi Metro, and an engagement-led activity would give us an extra boost," opines Esha Arora, vice president - Marketing, Jeevansathi.com. "The brief given to the agency was to effectively target a few localities and engage with audiences. Hence, the solution was the 'mandap', as it is an integral part of weddings in India," Arora adds. "Jeevansathi.com turns bus shelters into 'Shaadi ka Mandaps'"
The 10 locations were shortlisted basis the communities that Jeevansathi.com wanted to target along with a decent geographical spread across Delhi. This OOH activity has been launched as a pilot project in the city. 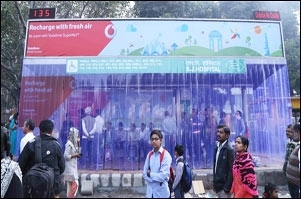 The brand is yet to evaluate the effectiveness of the complete marketing mix and will then decide the future course of action - whether such bus shelters turned mandaps will be established in other cities or not.